Diamine Damson is the color a ninja fruit would wear when trying to sneak into an orchard under the cover of darkness. Named for fruit it resembles, Damson is a dark, dusky plum that turns nearly black when used in a wet-writing pen. In a dry-writing pen, it produces a washed-out gray-purple line. It's a moderately saturated ink - neither as rich as other Diamine inks, like Imperial Purple, or as light as J. Herbin Poussiere de Lune, which it closely resembles. When written with a broad nib, Damson produces some nice shading, but delivers a fairly consistent line in a fine nib. Drying time is well within the realm of acceptability: on Rhodia paper, it was dry to the touch in 8 seconds, while on Staples Bagasse and cheap copier paper, it dried in 3 seconds. Feathering, too, I had no trouble with when using an extra-fine nib; the ink exhibited low feathering relative to each of the papers on which I tested it. Purple, at least in the United States, isn't typically considered a standard ink color. Our conservative business standards are boring blue and black. Diamine Damson, though, is subtle and subdued enough that you might be able to get away with it - particularly in a wet-writing pen, like the Visconti Homo Sapiens. When used with an instrument of that sort, the color is nearly indistinguishable from black at first glance. Diamine inks are available in a 30ml plastic bottle, which is utilitarian in appearance, and an 80ml glass bottle, which is slightly less so. The smaller plastic bottle has a neck that is very small in diameter. I found that some of my larger pens, like a Lamy 2000, would not fit all the way in, which made getting to the ink a bit of a challenge. My recommendation would be to go for the larger bottle. 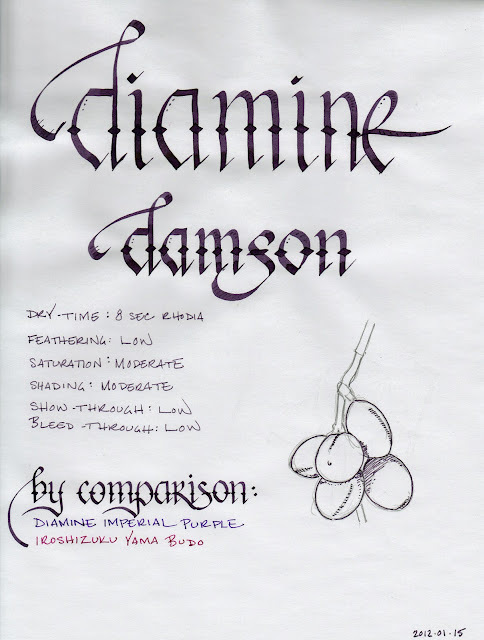 Damson is an interesting ink that behaves well on a variety of paper - something I've come to expect from Diamine inks. While it's not quite vibrant enough to make it into my daily rotation of inks, I could certainly see it being exactly what someone in a more conservative business environment is looking for. If that describes you, then consider this a recommendation. Review notes: I used a Pilot Parallel 3.8mm pen with a steel nib for the widest lines, a Lamy Joy Safari with a 1.9mm steel nib for the medium lines, and a Lamy Safari with an EF steel nib for the narrow lines. The paper is bright white 80 gsm from a Rhodia Bloc No 18.